They cranked up the music and built the suspense. The majority of Real Madrid’s Champions League winning squad had made their entrance in front of 80,000 euphoric fans at the Estadio Santiago Bernabeu, but one – the most important one – was still to walk out. 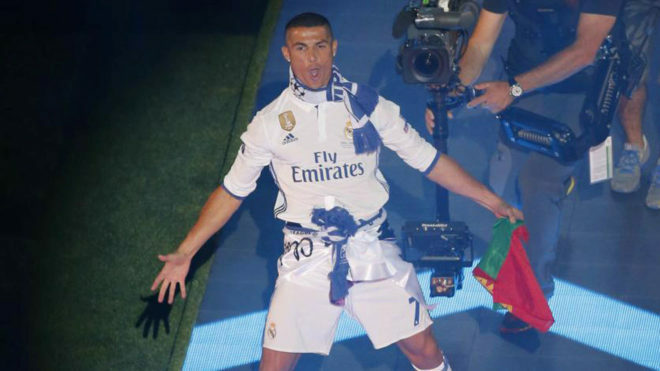 When Cristiano Ronaldo finally emerged, the reception was deafening. It was the least he deserved after his performance in Cardiff. What was long billed as ‘The Bale Final’ quickly turned into ‘The Ronaldo Final’. While the Portuguese had won the Champions League three times before, this was the defining performance of his career so far, which was quite the feat given all he has achieved in the game. He became only the second player to score in three European Cup finals, but this was the first time he’d truly dominated such a spectacle. This display came on the back of a run of form that saw Ronaldo score 16 goals in his final 10 games to finish the season. Those games included Champions League quarter-finals and semi-finals against Bayern Munich then Atletico Madrid, as well as the final stretch of the La Liga title race. The pressure was on and Ronaldo delivered like nobody else could. With such performances come the assessment of legacy, and Ronaldo’s shines as bright as his pearly white teeth. Another Ballon d’Or surely awaits the Portuguese given his achievements over the past six months, finishing the 2016/17 campaign with 51 goals from 50 appearances. It speaks volumes about the outrageously high benchmark he has set for himself that this was the lowest goal tally he’d finished a season with since 2012/13. Quite simply, Ronaldo is the greatest goalscorer of all time. When it comes to finding the net, there is nobody in the history of the game who has made it more of a scientific process, adjusting and adapting the way he plays to achieve maximum efficiency. Lionel Messi doesn’t even come close to him in that regard. Who the better player is, is up to personal preference. The Messi or Ronaldo debate isn’t one that will be definitely decided – a modern day Blur v Oasis for the sporting world. However, in breaking down Ronaldo’s identity as a player and defining him as a goalscorer, it’s entirely reasonable to stick him above his Barcelona adversary. In essence, Messi has remained the same player ever since he broke into the Barcelona first team fold as a teenager. He has adapted and tailored his game ever so slightly over the years, but in terms of fundamentals, the Argentinean hasn’t changed much. The same certainty cannot be said of Ronaldo, who first emerged as a streaky, scrawny winger and is now the most consistent and effective No.9 in the game. It can be argued that Messi is more naturally gifted than Ronaldo, that his goals are more spectacular, more likely to make the highlight reel, but every goal counts the same and the Real Madrid No.7 has more ways, more methods to score them. Goals are football’s most valuable currency and Ronaldo is richer than anyone else. At 32, Ronaldo should be suffering some sort of decline, and in some ways he is. Zinedine Zidane recognises that he can no longer play the Portuguese in every single match over the course of a season, resting him at strategic times. While he is certainly no slouch, the lightning pace that once accelerated him effortlessly past opponents is now gone. It’s rare that Ronaldo even dribbles once in a match. Yet this only underlines his astonishing longevity. This season, Ronaldo became only the second La Liga player to score 25 goals or more in eight consecutive seasons. The way he is going, the Portuguese will most likely make that nine consecutive seasons and probably 10 after that as well. He is unstoppable, as Juventus, European football’s strongest defensive unit until Saturday, would attest. Even when someone does figure out a strategy to stop Ronaldo, he finds a way to get round it. That is the mark of his greatness.